LUBBOCK, TX (KCBD) - These days, there's an app for everything - ordering food, calling a ride, and now, even finding the right medical care. "My first thought is it sounded a lot like the Uber for health care," said John Henderson, CEO of Childress Regional Medical Center. Imagine something unexpected - you are bitten by a rattlesnake. You arrive at the hospital only to find they can't treat you or don't have an open bed. So, you wait. And wait. While you're waiting - or what's called 'emergency room boarding' - nurses are making phone calls, sending faxes, and making follow-up phone calls, just trying to find somewhere to get you the right treatment. "That's a pretty cumbersome process, obviously not a very effective use of their time and they've got more important things to take care of," said Henderson. That's where XFERALL (pronounced trans-ferall) comes in, a new app that finds where a patient can get treated immediately. "We've taken a technology to standardize the process for health care providers using a technology that automates identifying what hospitals have the ability to take care of that patient," said Shana Palmieri, a co-founder of XFERALL and the Senior Vice President of the Behavioral Health Division. In simple terms, medical centers can use use the app to send an alert to participating hospitals, and if they're able to treat that patient, they accept the request, and the transfer begins. And it's already working right here in Texas. "We have had a need for the app and we have tried to transfer to the receiving facility in Amarillo, and it's worked great," said Henderson. The app works in real time, sending messages and documents electronically. "We're excited to not have to use the paper documents. 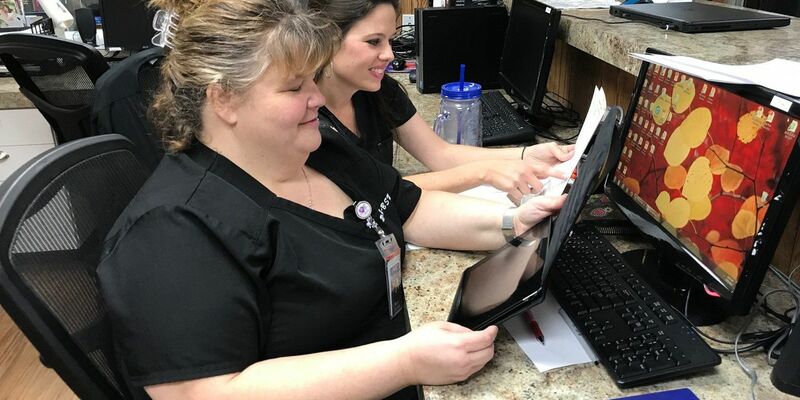 The staff can use it on their iPhone, or a laptop, or an iPad, and that way they'll be able to use it on the go," said Tammy Williams, Senior Vice President of Patient Care Services at University Medical Center in Lubbock. The founders say right now they're focusing on rural facilities in Texas that need help identifying resources, whether for critical care or behavioral health patients. "Many hospitals don't have an inpatient psychiatry unit or the ability to treat addiction, so they need to transfer all of those patients to a facility that has that ability," said Palmieri. The hospitals say it will help with their main focus: giving patients the best care possible. "The faster we can get them to that level one trauma center in Lubbock, the better their outcome is going to be," said Henderson. "Currently we accept between twenty-five and thirty patient transfers a day, and so we're hoping that we'll be able to accept more patients," said Williams. XFERALL is HIPAA-compliant, so patient information is confidential, and there is no cost to the patient. The company is currently operating with hospitals in the Lonestar State, but they plan on expanding their services throughout the country. You can learn more about XFERALL by visiting their website, www.xferall.com.